The mod recommendation tool is great for advice just don't let it actually assign mods. Go to "advanced" and it will recommend which sets to put on each toon (which are normally pretty correct). 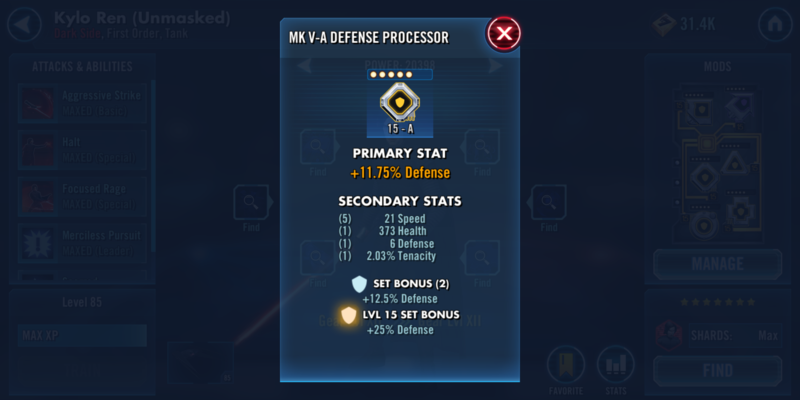 Click on the little "i" icon in the upper right corner of the "advanced" box and it will show you which secondary stats to look for and which primaries should be on each mod position. It then also gives a 1st 2nd and 3rd best choice for each. If you don't like what it suggests, feel free to go to Crouching Rancor Mod Advisor. It does pretty much the same but with less detail on secondaries. Thanks, but what about speeds? How much is considered good on each mod because I see people with double added speed on their mods calling them "B" mods which aren't even that good. As a general rule don't waste credits/resources on mods that don't have speed...unlock the base stats for as cheap as possible to see if speed shows up. Grey- toss up, I usually sell for extra currency as they only earn base secondaries with no upgrades until sliced. The slicing material is better used on a green mod. Diamonds, circles and squares will fall in buckets. Sell away,however; always keep +speed primary arrows, and LOCK them as soon as you earn one. I also keep crosses with potency, offense, tenacity, as well as Crit Chance/Crit Damage triangles. Green - upgrade to level 9 to see if you roll +speed on any of the four secondaries. If you did, go to level 12. If it hits on speed, fantastic, if it hits on a character specific stat you need (offense for attacker, potency, +protection etc) almost as good. Level that mod to 15 and use it. Slice only mods that upgrade twice (2) on speed. Blue - upgrade to level 6 to see if you roll +speed on remaining two secondaries if it wasn't there to start. If no speed, sell the mod unless it has great stats you might need for a "B" or "C" team. If it shows speed go to 9 & hope for an increase to speed. If not, that's ok, go to 12. If it didn't hit there you still have a +3-6 speed mod that is ok for a low-use toon. Don't slice. If you hit (2) or (3) on speed then absolutely slice it to purple. Purple - I tend to keep most purples unless they have absolutely garbage secondaries. Might have one of the first 3 secondaries as speed, if not; increase to 3. If you get +speed keep upgrading. Ideally you'll strike a (4) upgrade on speed, which is pretty rare. But I have plenty of purple mods that have several (2) stats and +8-10 speed. Decent mods but I won't slice. Only slice if it's (3) or (4) on speed. Not worth the larger investment of slicing material for less than that. Thank you guys very much this has helped - ill go through my mods later tonight and sell all that dont meet these criterias.